Adapted from the article “Irrigation Management Tools for Developing Walnut Trees” by Richard P. Buchner, UCCE Farm Advisor, Tehama County, Allan E. Fulton, UCCE Farm Advisor, Tehama, Glenn, Colusa and Shasta Counties in the July 2014 Sacramento Valley Walnut News. Irrigation management decisions for young trees are more challenging compared to mature trees. In mature orchards, the leaf area and root zone are relatively constant. In developing orchards (years 1-6) irrigation management must account for an expanding canopy and enlarging root zone. As the leaf area expands, water loss through stomata increases, demanding more water. As roots elongate horizontally and vertically, they access additional soil moisture. Water placement is much more critical in developing orchards, particularly in the first year, to target a much smaller root system. Misplacement of the water also encourages weed competition and other challenges. As trees grow, root systems expand and placement becomes less critical. Ultimately for mature trees, the crown area is purposely kept dry to discourage Phytophthora infection. The goal in a developing orchard is to grow a large, structurally sound bearing area quickly. Several tools/techniques are available to help with irrigation decisions to get young walnut trees off to a good start. Orchard Evapotranspiration – Real time daily or weekly estimates of orchard evapotranspiration (ET) are available, but they are typically projected for mature orchards with larger, more constant canopies. The challenge for young, developing trees is to adjust ET values to accurately predict water loss for a small expanding leaf area as well as accounting for expanding access to soil moisture as root systems grow. Figure 1 shows how that might be done. Go here for much greater detail on orchard ET. Figure 1. Water use estimates for first, second, third and fourth leaf walnut trees. PAR is a measure of sunlight interception. PAR stands for Photosynthetically Active Radiation. 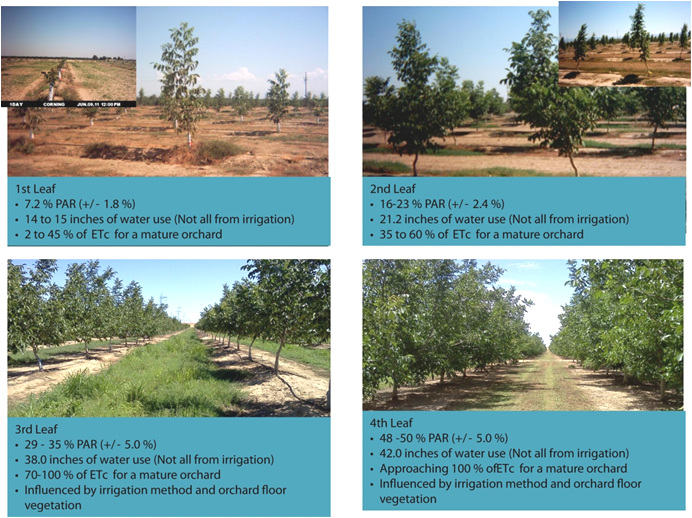 Applied Water – Measurement of applied water and/or knowledge of irrigation system performance are necessary to know whether the amount of irrigation and rainfall match estimates of real-time orchard ET. Flow meters are relatively inexpensive and fairly easy to install. Irrigation system evaluations may be available for growers in Tehama, Glenn, and Butte Counties from the Tehama County Resource Conservation District Mobile Irrigation Lab. During the past decade, the Mobile Irrigation Lab has been a free service. However, there may be a fee for the service in the future. Soil moisture monitoring – Visual evaluation, tensiometers and/or resistance blocks are the typical tools for use in developing trees. Once the orchard is developed, more sophisticated soil moisture monitoring devices may be used. One simple and effective method is to auger holes directly under the planted tree and visually evaluate soil moisture for adequacy. Visual inspection will indicate whether enough water is penetrating the soil in the smaller root zone. Soil color and how well the soil sample adheres to the auger and/or your hand are related to moisture content. Tensiometers and resistance blocks are available to measure root zone soil moisture tension. Placement is critical when installing these devices. They are only as good as the root zone they represent. Some irrigation managers place a resistance block in the root mass at planting. Blocks can be checked frequently using a hand held meter. Tensiometers use a pressure gauge to indicate soil moisture tension. Additional information on measuring soil moisture can be found here. Midday Stem Water Potential – More and more irrigation managers are using pressure chambers to measure midday Stem Water Potential (SWP). In simple terms, the pressure chamber measures the “blood pressure” of a plant. The higher the blood pressure the greater the water stress. The pressure chamber has the advantage of measuring tree response to soil moisture conditions. The disadvantage might be cost and SWP measurements must be made between 12 to 4 pm. Irrigation management using SWP is illustrated in Figure 2. Notice that -6 to -8 bars water stress was maintained in season for shoot growth and -10 to -12 bars water stress was allowed in September to slow growth and prepare trees for winter. Here is a complete guide on using the pressure chamber. Figure 2. Example of how a pressure chamber SWP is used to manage irrigation in a first leaf walnut orchard. The baseline represents SWP when soil moisture is not limiting ET.